Heat oven to 400°F. Unroll 1 crust on work surface. Into medium bowl or food processor, crumble almond paste. Add 1 teaspoon cornstarch and the egg white. Mix or cover and process until smooth. Spread on crust to within 1 1/4 inches of edge. Unroll second crust; place on top and pat together gently. Place stuffed crust in ungreased 9-inch glass pie plate. Seal edges; flute. Cover edge with foil; fit second pie plate inside first pie plate on top of crust. Bake 10 minutes. Remove top pie plate; gently prick crust surface over filling about 15 times with fork. Bake uncovered about 15 minutes longer or until crust is light golden brown. Cool completely, about 1 hour. Meanwhile, in 2-quart saucepan, mix granulated sugar and 3 tablespoons cornstarch. Stir in strawberries. Heat to boiling over medium heat, stirring constantly. Cook and stir 3 to 5 minutes or until filling thickens. Refrigerate about 30 minutes, stirring once, until cool. 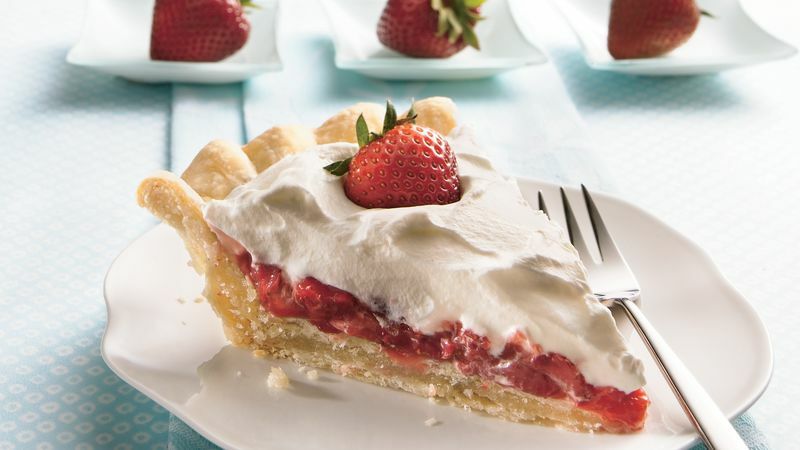 Just before serving, spread strawberry filling in crust. In medium bowl, beat whipping cream, powdered sugar and vanilla with electric mixer on high speed until soft peaks form. Spread on top of pie. Garnish with strawberries. *1 bag (1 lb) frozen unsweetened strawberries, sliced and thawed, can be used instead of the fresh. If you don't own two pie plates, purchase a disposable foil pie pan to place on top of the crust. Mary Howe Schwartz, from Lunenburg, MA, won first place at the 2006 Massachusetts State Fair for this recipe. She went on to place in the national Pillsbury® Refrigerated Pie Crust Championship.